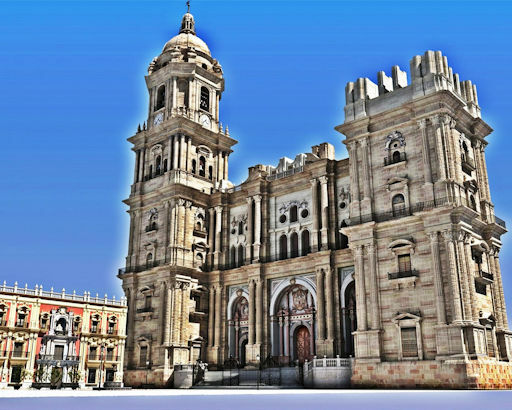 Work started on Santa Iglesia Catedral Basílica de la Encarnación, Málaga Cathedral, in 1528 and it was considered complete in 1782. Both internally and externally it is in high Renaissance style and it is truly magnificent. It seems a bit churlish to mention that it is actually unfinished. The north tower is 84 metres (276 ft) high, making this building the second-highest cathedral in Andalusia, after the Giralda of Seville. The south tower remains unfinished. A plaque at the base of this tower states that funds raised by the parish to finish it were used instead to help the British colonies - which eventually became the United States of America - to gain their independence from Great Britain. This unfinished state has led to the Cathedral being called La Manquita, meaning in English, The One-Armed Lady.